Do you see yourself as the Don? Are you among the million Don fans who wish to play the Don or another character from the popular film? If your answer is yes, then here’s your chance to be it. 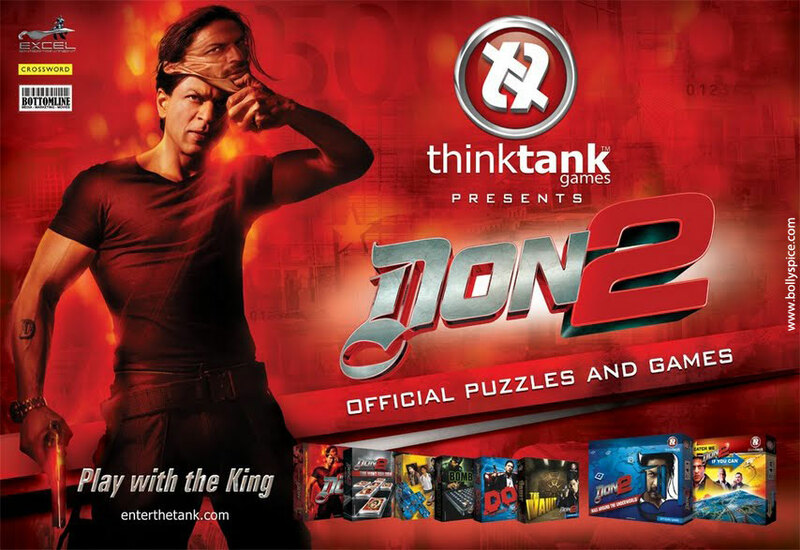 That’s right Think Tank one of the most popular players in the gaming industry brings to you a range of 8 puzzles and games based on the forthcoming blockbuster – Don2, starring Shah Rukh Khan, Priyanka Chopra, Lara Dutta & Boman Irani. The film directed by Farhan Akhtar will see a line of addictive puzzles and intelligent games based on the amazing world of Don which are sure to leave you engaged. Saturday saw the unveiling of these exciting games at Inorbit Malad in Mumbai by none other than King Khan himself along with the director Farhan Akhtar amidst fans who sure wanted more of the duo. The puzzle collection features innovative brainteaser puzzles and mind-benders that will tempt, compel and consume. And when you feel competitive, you can join Don, Roma, Malik, Sameer, Vardhaan and Ayesha on a rollicking journey through a fabulous collection of original games that the whole family will enjoy! Hunt, chase, catch or find Don… and if your heart so desires – become Don! The collection offers an immersion in the Don universe like never before. Farhan quotes” ” Don is all about the mind and using it to out-think others… It is also about strategy. So the game was an obvious extension to the film… A chance for players to think like him and beat the competition. Very excited about its release”. 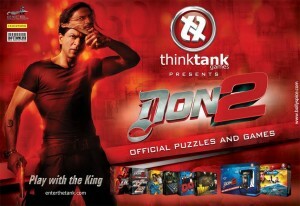 “We at Thinktank are grateful to team Don 2 for collaborating with us. We have put in some great ideas and made these games. We can’t wait for these games to hit the market so that now everyone can be a part of Don 2. Collaborating with Bottomline and Excel as partners to make this happen , indeed is a milestone in the traditional world of gaming” Said Vishal from Thinktank. “ I think this is a great collaboration, and getting the two best brands Thinktank and Don2 together didn’t take much because both were looking for something creative and the product speaks volumes. The games surely are addictive and I am sure that everyone who is a ShahRukh Khan or a Don fan, will surely enjoy it,” says Tanaaz Bhatia of Bottomline media, the company that got these two brands together. So, help Don escape from the prison in ‘Race around the Underworld’ or help him crack the secret Vault in the mind-ticking game ‘The Vault’ or if you want that adrenalin rush then ‘ The hunt for Don’ is just right for you. So, whether you are 6 or 106…These games are for you. Get to a store near you and play Don.